Jesse James opens with a few scenes of railroad negotiators showing up before families in Missouri, demanding that they sign away their farms for one dollar an acre, much less than what the landowners had originally paid for the land. If the landowner resists selling, the railroad men use strong-arm tactics. The negotiators eventually show up on the land of the James family, where Mrs. James is living with her two sons, Frank and Jesse. When the railroad negotiator and his thugs try to pull the same treatment on Mrs. James, her sons “help” her out. Jesse ends up shooting one of the railroad thugs in the hand. Jesse calls upon the families to meet at his home to fight the tactics of the railroad company. At the meeting, though, the bad news comes that Jesse has been charged with assault. At the pleading of their ill mother, Jesse and Frank leave home to hide from the law, saying that she couldn't bear it if something happened to them. As the boys hug her goodbye, she tells Frank to take care of Jesse. Meanwhile, the determined railroad employees return to the farm at night. Jesse‘s mother ends up getting killed when the home is bombed . Jesse takes revenge by following the railroad negotiator to the local saloon. Though he guns him down in a fair fight, Jesse is branded an outlaw, and a reward is posted for his capture. 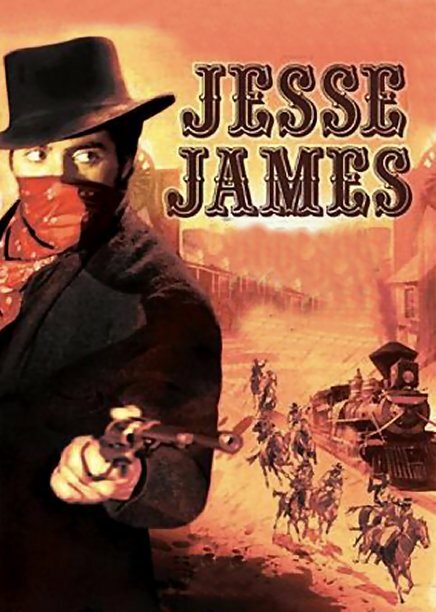 Jesse and Frank go into hiding and are joined by other outlaws to form the James Gang. They begin a life of crime by robbing a train, telling the people to be sure to collect from the railroad because the railroad is responsible for what happens on their trains. At one point in the story, Jesse is offered a light sentence if he surrenders. He does surrender, but the deal goes awry. Frank helps break Jesse from jail, and they return to their life of lawlessness. Zerelda, known just as “Zee”, is Jesse’s love from the outset of the story. When they decide to marry, they go to a church, where they barge in on an ongoing church service. Jesse announces that they want to get "hitched", and the minister agrees. When he gives his name as "Jesse Woodson James", the minister is startled, but then he gives his approval, saying that he was among those who suffered at the hands of the railroad. Others in the congregation are sympathetic, too, as they had been affected by the railroad expansion. Jesse and Zee move from place to place, living under assumed names. Zee tries to get Jesse to go straight, and Jesse seems to want to do this, but he isn’t able to do so. After Jesse fails to show up for the birth of their baby, Zee leaves him. Jesse starts to go after her but decides she would be better off without him. It is five years before they see one another again. Zee has tried to forget him, but, he always is on her mind, it seems. When he he is badly injured in a bank robbery, she goes back to their old home, feeling that is where he would go if he were still alive. She then introduces him to his five-year-old son and nurses him back to health. They make plans to begin a new life in California. Their plans are ruined when Bob Ford, a James Gang member, shoots an unarmed Jesse, as he was standing on a chair straightening a picture.